August 27, 2013 Kathe Skinner, M.A., L.M.F.T. In the modern age, long past the time Aesop and Burl Ives were telling stories, hybrids thrived. One such unlikely combination was the grasshopper and the ant. Now, you would think that being such behavioral opposites their paths would never cross. Somewhere in the reeds and weeds all the bugs were doing their thing. Beetles rolled balls of doo-doo around in circles. Bees started happy hour before five o’clock while cockroaches didn’t look anyone in the eye. Ants, on the other hand, saw none of this, nor did they care. Their journey was always the same: back and forth back and forth from here to there here to there without looking left or right the whole time. “Don’t wait it’ll be too late don’t wait it’ll be too late,” That was the mantra of the ant. A world away – in bug terms, actually only a few yards – a grasshopper did grasshopper things. A traditional dance danced to a traditional song. A game of Reverse Limbo. Hopping and leaping hopping and leaping getting the rep of not being in one place too long. A grasshopper’s boots were never parked under anyone’s bed. “La la la la la la live for today.” That was the grasshopper’s mantra. Now, I know a lot, I’m very smart and awfully tuned-in, but, to be honest, I don’t know how the two of them – being so different and all – got together. All that, plus leaving room for each to do their own thing. Here it is, the end of my story. I thought long and hard about the best way to finish it. The truth is that the end is the beginning as much as a beginning is an end in itself. 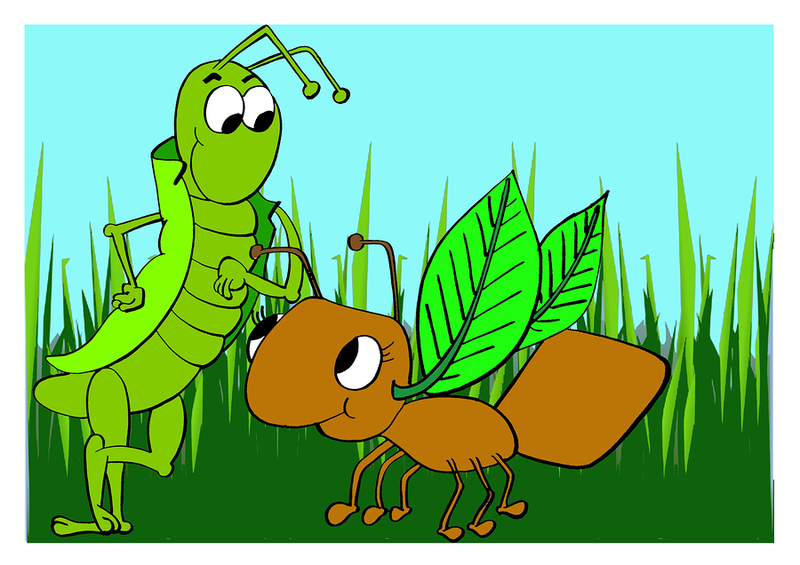 It’s truly true that an ant by itself and a grasshopper alone is never as juicy as the two together. Two together is the only way to live happily ever after. ← YOU LOOKIN’ AT ME?